Located at the eastern end of the picturesque Adventure Bay, the Fluted Cape circuit is a fantastic 3 hour 6km return walk taking in crystal blue waters, remarkable coastal cliffs and abundant wildlife. The trail is steep in sections with some substantial climbing required to reach the Fluted Cape summit at 272m. The shorter 1 hour return walk along the coastal section of the trail to Grass Point is recommended for families with young children. View Google Map Directions * A ferry crossing is needed to access Bruny Island. 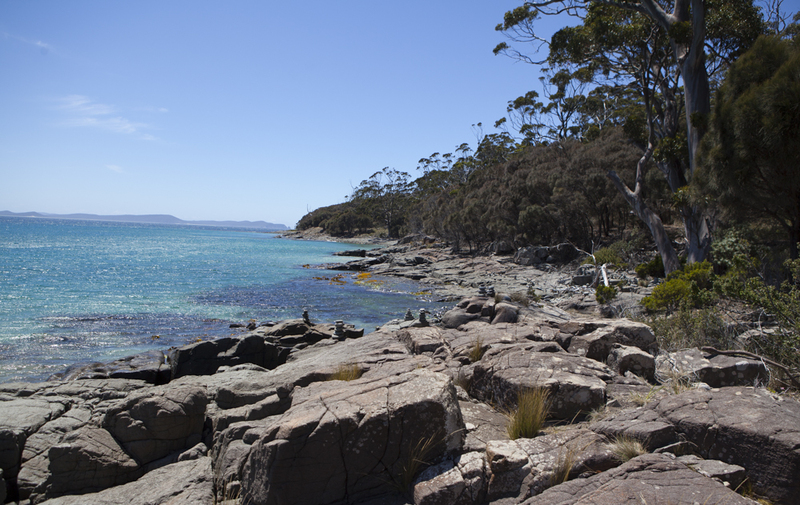 From Hobart head south along the Southern Outlet (A6) for 10km. Take the right hand lane at the Kingston Bypass and continue on for 2km before taking the 4th exit to Channel Highway (B68) at the roundabout. Continue for 18km, taking a left hand turn onto Ferry Road just outside of Kettering. Take the 30 minute ferry to Bruny Island (details can be found here). 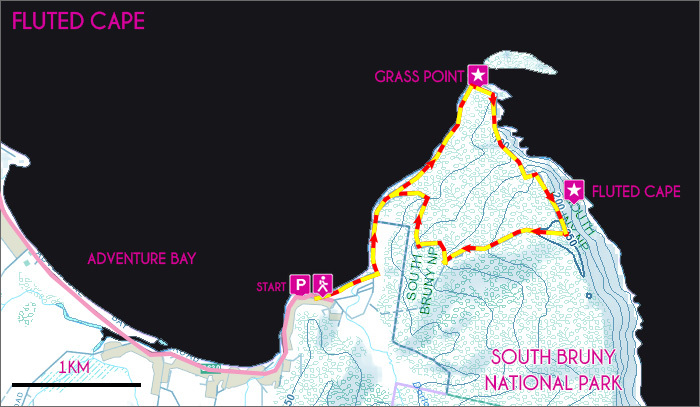 Once on Bruny Island follow the Main Road (B66) for 30km passing across the Neck. Next turn left onto Adventure Bay Road a follow it to the end car park (located at the second of Adventure Bay’s beaches). The Fluted Cape walk begins here. The Fluted Cape circuit can be walked in either direction. The following guide follows a clockwise approach, this results in a steep climb at the beginning and gentle return walk from the Cape. Commencing from the eastern end of Adventure Bay the Fluted Cape walk begins with a short stroll along a stunning white sand beach before entering dry eucalypt forest packed with tall blue gums. For the next 30 minutes the trail edges along the coast of crystal blue waters, passing through sections of dense sheoak forest before reaching Grass Point. Used as a whaling area between 1820-40 this area is littered pioneering relics. 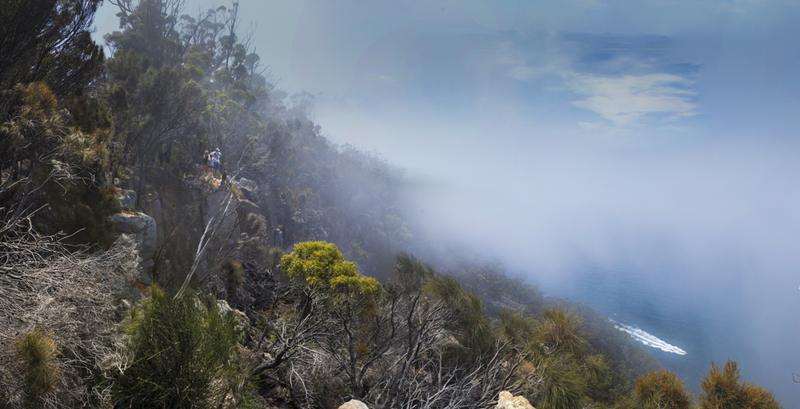 From Grass Point the trail climbs steeply to the summit of Fluted Capes (272m). During the initial section of the climb multiple views of the Cape’s towering dolerite cliffs and Penguin Island are presented. Once at the summit, distant views of the Tasman Peninsula are offered with the ridge lines of Cape Pillar clearly visible. In migration months between June and October you may be lucky enough to spot a pod of Southern Right Whales along the section of ocean below the Cape. After taking some time to explore the furthest reaches of the summit cliffs, the trail heads inland and gently descends to the carpark through lovely eucalypt forest. Bennett’s wallabies are in abundance in this area. Keep an eye out for Bruny Island’s unique white wallaby. The Fluted Cape track is highly recommended as a short day walk for visitors to Adventure Bay that want to explore the magnificent area further. The trail skirts along the edge of the cliff face at multiple points. Take care when approaching unprotected track edges.